Copycat Tagalong Bars are a Girl Scout Cookie copycat recipe with a shortbread crust, creamy peanut butter filling, and chocolate topping. If you don’t have any Peanut Butter Patties these will satisfy your craving for peanut butter and chocolate bars! Please do not ring the bell, open the screen and pound on the door. Obviously the original sign was missing something important. Thin Mints are great…but Tagalongs are almost just as good. Sometimes? When I want peanut butter? They’re better. So I made my own Tagalong/Peanut Butter Patties. And I made them into bars because bars are way easier. Plus? I can make a super rich and thick shortbread layer/crust and that’s kind of the point. How do you make the best copycat Tagalong Bars? The bottom layer is the cookie layer: a buttery, rich shortbread cookie. 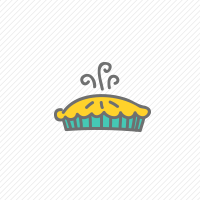 It’s pressed into your 9×9″ pan and baked. It’s soft and perfect. 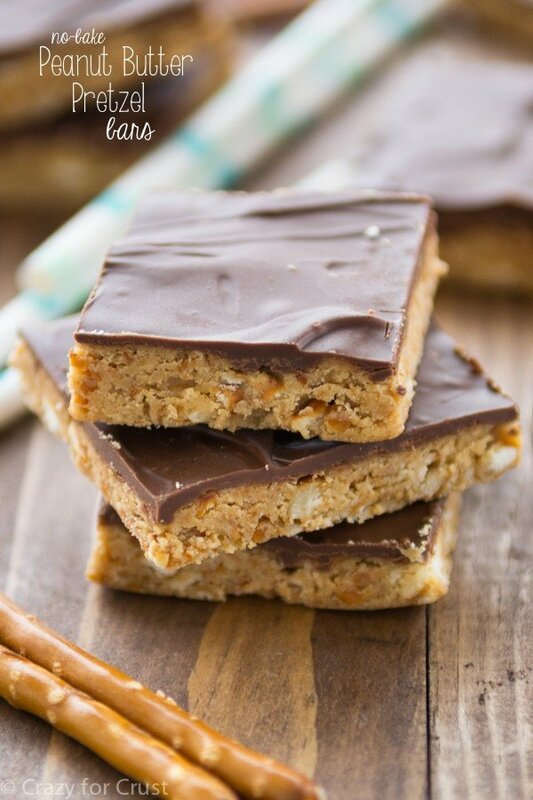 The peanut butter layer just makes these bars. It actually tastes like the peanut butter inside a Tagalong! Peanut butter, powdered sugar, and vanilla gets mixed and spread over the crumbly shortbread. The chocolate. Obviously, a copycat tagalong bar needs chocolate. I used simple milk chocolate chips (you could use semi-sweet) and I added some shortening for three reasons: so the chocolate would melt easier, it would spread easier, and so it would cut easier. Mission accomplished. A note about cutting these bars: before cutting, you need to let your chocolate set. I did this on the counter, overnight. Since it’s winter, it gets cold in my house and the chocolate hardened no problem. You can chill them to speed up the setting (or if it’s summer), but be sure that you bring them up to room temperature before cutting, for 2 reasons. One, if you cut cold chocolate (even with shortening in it) it will crack, leaving your bars looking like plaster after an earthquake. And two, the peanut butter does not harden. It stays soft, like peanut butter. If you have very cold chocolate on on top and cut it with a knife, the force you exert on the top will cause the peanut butter to squish out the sides. That’s not good. 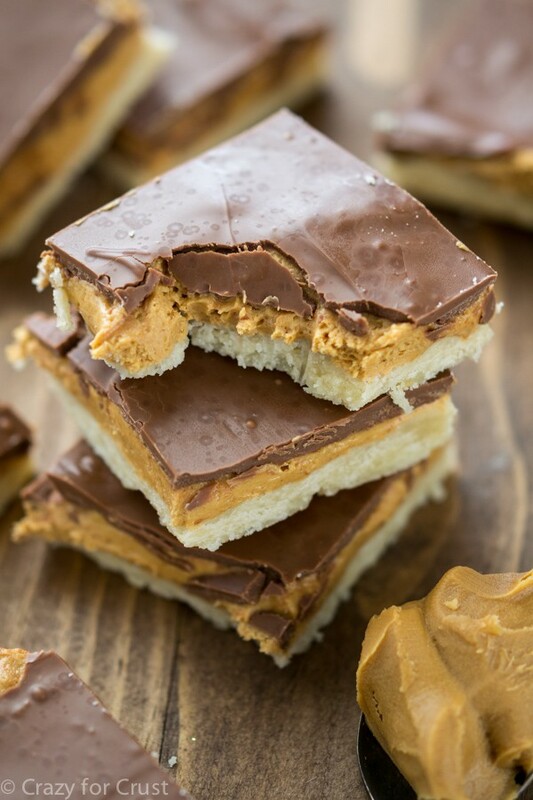 Copycat Tagalong Bars are the perfect way to enjoy Girl Scout Cookies anytime – they have a shortbread crust, a peanut butter filling, and a chocolate topping! Moral of the story: room temperature cutting is important. The end. You probably should answer. I’m not selling magazines or solar, but I do come with edible presents. 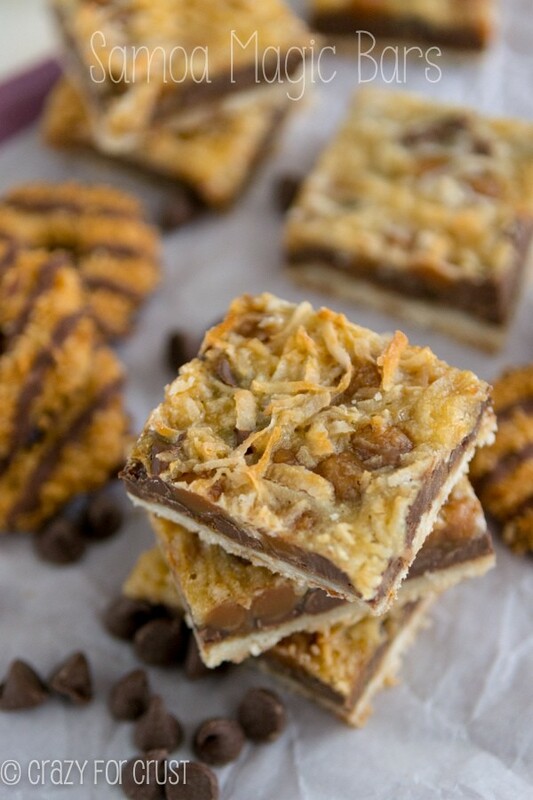 We all know how much I love Girl Scout cookie recipes, like Samoa Magic Bars or Thin Mint S’mores. I also loved making a chocolate version of these bars! And you can click here to see more of my PEANUT BUTTER recipes! Did you know you can make homemade Tagalongs using Ritz Crackers? Genius! These Tagalong Bars are just like the Girl Scout Peanut Butter Patties...but they're in bar form. And they're homemade. 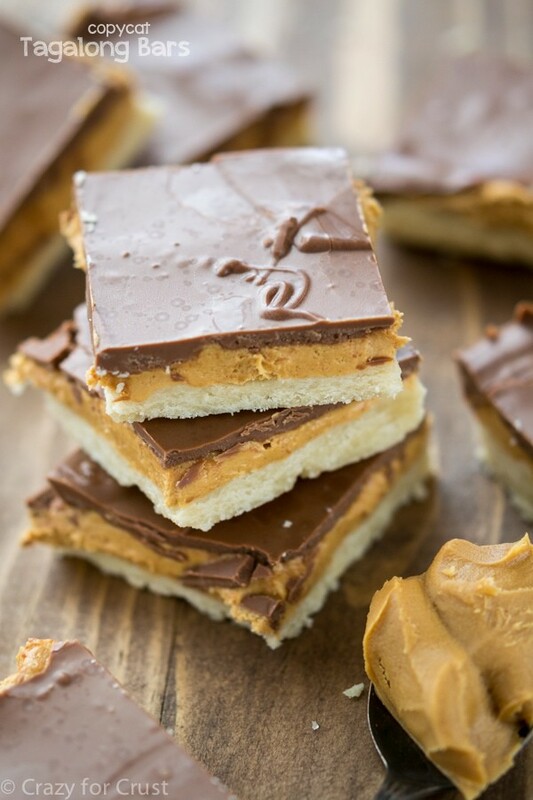 A shortbread bar cookie is topped with peanut butter and chocolate for a bar version of your favorite cookie. Cream butter and 1/3 cup powdered sugar in the bowl of a stand mixer (or using a hand mixer). Add 1 teaspoon vanilla and mix, scraping the bowl a few times to make sure that the butter and powdered sugar are completely incorporated. Mix in salt and flour until combined. It will take a few moments to turn from crumbly into an actual dough. Just keep mixing until it does. Press dough into the prepared pan, like a crust. Bake for 14-18 minutes, until the shortbread is no longer shiny or translucent. It won’t brown very much, if at all. Let cool completely before the next step. Mix peanut butter, 1/2 cup powdered sugar, and 1 teaspoon vanilla with a hand mixer. Spread evenly over the top of the cooled shortbread. Melt chocolate chips and shortening in a microwave safe bowl. (Heat on high in 30 second increments, stirring between each, until melted and smooth.) Spread over the top of the peanut butter layer. That peanut butter filling looks to die for! Love how this is a simple recipe but most likely packs a punch. Can’t wait to try these out, pinned this recipe! Yummy tagalong bars, Dorothy! And those door signs are too funny! Never tried a tagalong bar before.. think it’s something to do with living in Australia and not having Girl Scouts. 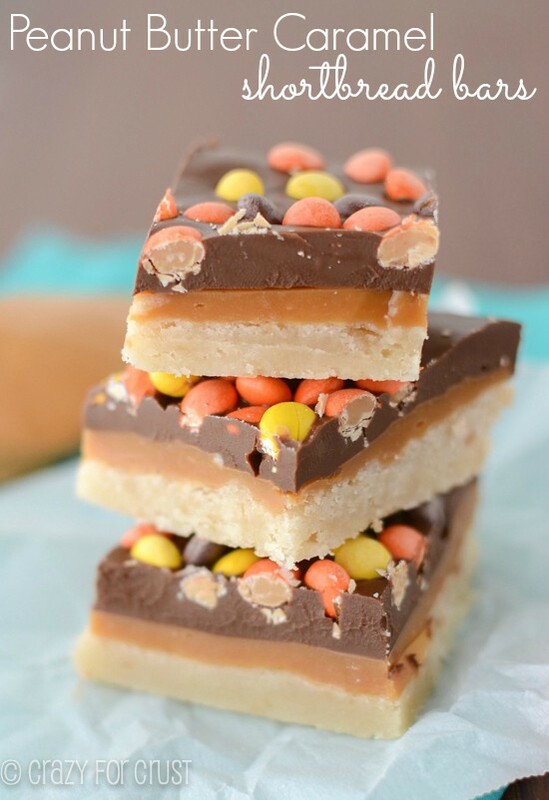 I definitely have been missing out on something delicious though – I must make these bars! I’m totally drooling over these! Those are my three favorite Girl Scout Cookie flavors as well. Fun fact: there are two different Girl Scout Cookie bakers. One baker calls them Tagalongs, the other calls them Peanut Butter Patties. Same with Samoas and Caramel deLites (which I just can’t get on board with). 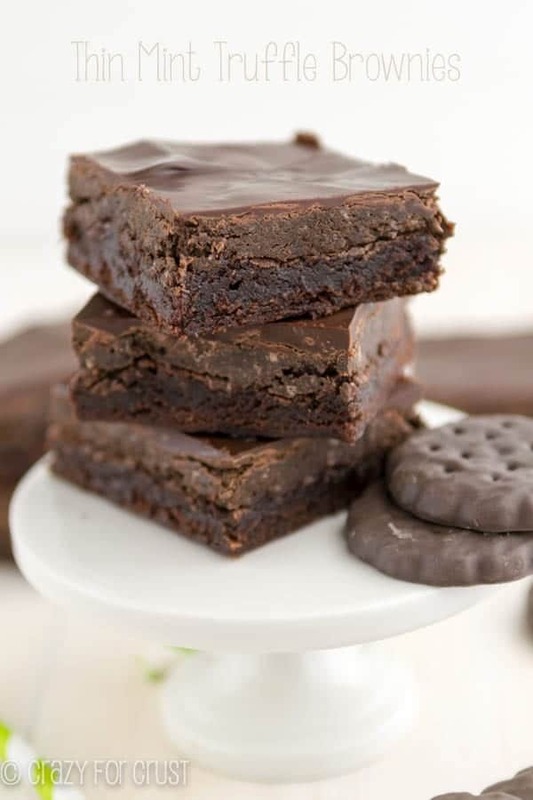 But whatever they’re called- I need to make these! That is so good to know! Finally, mystery solved!! I definitely sit squarely in the tagalong camp! They are my favorites. I am seriously considering a no solicitation sign on my front door with the exception for girl scouts. Too funny! 2-Tagalongs are totally my fave (and thin mints…and samoas) so I LOVE that they’re getting the spotlight with these amazingggg bars! I am drooling over that peanut butter filling!!! OMG! You can ring my door bell any day…as long as there are treats involved. Ok, I’d let you in even with out treats 😉 These bars look absolutely killer…that creamy peanut butter filling is calling my name. I didn’t see a single girls scout last year! These look better than the original! Thank goodness for fixes like this for us impatient people. There might need to be a Tagalong support group. LOL!! Yes, I’d be there right along with you. Oh gosh, I know!! Online is going to be dangerous! Tagalongs are definitely my favorite GS cookies. I have made copycats of them at home but this bar version is so much easier! Brilliant.